Image credit: © Henry J. Hipp at Flickr. Some rights reserved. Pelage: Brown coat with a "collar," or ruff of hair, framing the cheeks and extending to the ears. Male coats are brownish-gray, slightly lighter than females, with a reddish-orange or creamy collar. Females have darker body hair and less developed collars. Tails are dark reddish-brown. Diet: Diverse diet of over 120 plant species. Primarily consumes ripe fruit; also eats flowers and leaves. Occasionally eats invertebrates. Longevity: Typical lifespan in the wild not known. In captivity, life expectancy is c. 22 years. Maximum longevity of c. 32 years reached by a male and female in North American zoological institutions. Feature Facts: Also known as the red-collared or red-collared brown lemur, the collared lemur was previously considered a brown lemur (E. fulvus) subspecies. Primarily arboreal and sociable, it lives in multi-male, multi-female groups of 2-17 individuals without a clear dominance hierarchy. 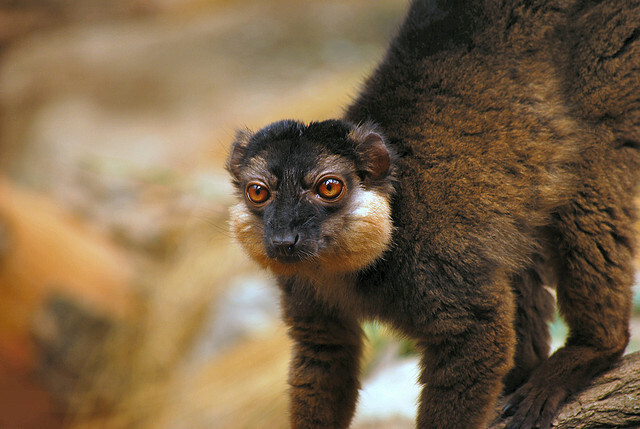 It is a relatively large lemur, similar in size to the ring-tailed lemur. The species has undergone a population decline of ≥50% over a period of 24 years, which is expected to continue. How to cite: Collared Lemur (Eulemur collaris) Fact Sheet. c2015. San Diego (CA): San Diego Zoo Global; [accessed YYYY Mmm dd]. http://ielc.libguides.com/sdzg/factsheets/ CollaredLemur. Many thanks to Dr. Giuseppe Donati for providing content review of this fact sheet. He is a recognized expert in the area of primate behavioral ecology and conservation. He has many years experience studying collared lemurs in southeastern Madagascar. Dr. Donati serves as Lecturer in Biological Anthropology with the Department of Social Sciences at Oxford Brookes University, and he is a council member of the Primate Society of Great Britain and a member of the IUCN/SSC Primate Specialist Group. We also wish to thank Andrea Katz, Animal Curator at the Duke Lemur Center, for her helpful input and suggestions.